Does the horse look thin or emaciated? Is the horse very old or very young, and does this play a factor in its physical appearance or condition? Does the horse have drinkable water? Is the horse fed once a day? Is the living environment unsanitary? Has the horse been abandoned? Is the horse sick, injured, lethargic, or distressed? Although Crystal Peaks is limited in the number of animals it can manage, if you know of a potential horse rescue situation in the Central Oregon area call our office at 541-330-0123. Please make sure to inform us that you are referring to a potential horse rescue and not a horse donation. If you feel your horse would be a good fit for children, please check out our list of Similar Ministries. Should you find a ministry located near you or a ministry that you feel drawn toward, please contact that organization to inquire about their space availability. 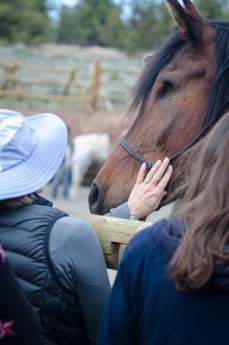 We have also designed an Equine Donation & Adoption Program for the purpose of creating a forum where those who are looking to place their horse can meet those who are seeking to adopt a horse. 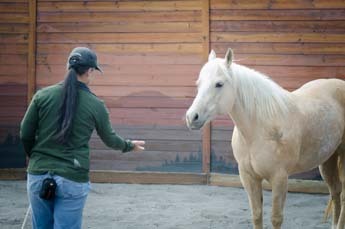 This program is offered as an additional resource and may help you find the correct home for your horse. For those with elderly horses who have served you well in their youth, we strongly encourage you to "return the favor" by keeping them. Thus, you are completing the circle of love and respect by providing a safe, secure, and familiar home until the end of their days. If you are considering getting a new horse and do not have the funds to support two animals, we recommend waiting to acquire a new horse until you have found a healthy, safe and happy home for your retired equine.